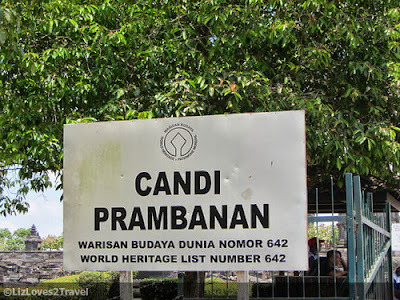 After Borobudur, it took us forever to get here. I hated the unnecessary 30 minutes of waiting before we can go. We were all under the impression that we're all going back together at the same car with the same driver. 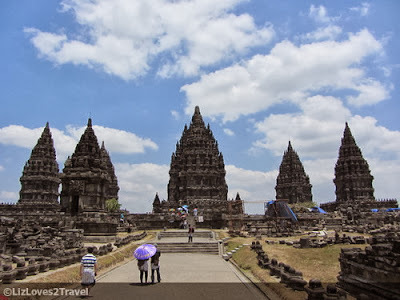 We were baffled when some of us were endorsed to another driver for our trip to Prambanan. The 1.5 hours of travel also felt like eternity. We got so bored already, eaten whatever and fallen asleep. We arrived at around 11:00 AM. Oh yeah, the sun was relentless. Good thing, there are umbrellas for rent. We rented one for Rp 10,000 (Php 40) each. 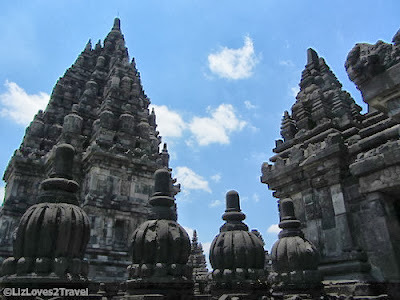 Prambanan is much nearer to Jogja. It is just 17 km northeast of the city. Unlike Borobudur which is a Buddhist temple, this one is Hindu. 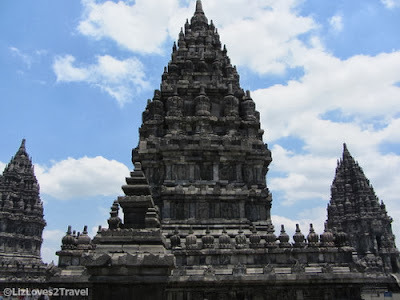 It is also listed in UNESCO's World Heritage Sites and considered as the largest Hindu temple in Indonesia. The temple is said to be built by the Mataram Kingdom on the 9th century. 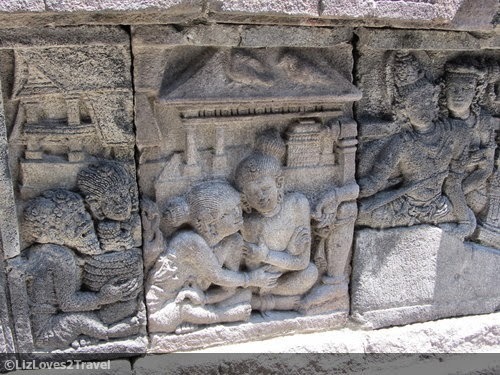 They were the successors of the Sailendra Dynasty who built Borobudur. There are 16 temples in the main square. But there are just three main temples called Trimurti dedicated to the gods Shiva, Vishnu and Brahma. The kings of Mataram kept on building and building until there had been another 224 more temples outside the main square. 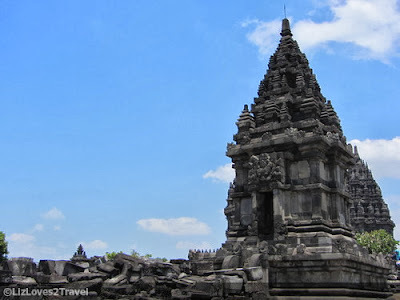 Most of this mini-temples were already in ruins due to deterioration. Prambanan's noticeable feature is it's sharp and rugged architecture. Typically very Hindu with its high spires. 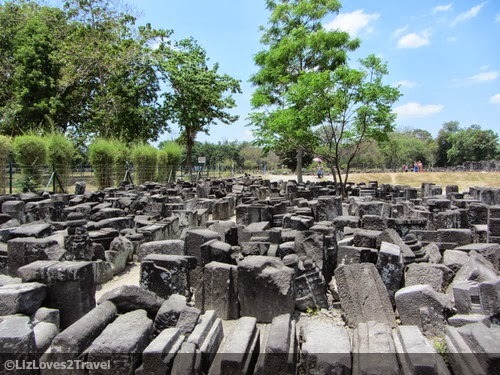 Like Borobudur, it had also been abandoned for quite a long time for similar ambiguous reasons. It could be the decline of the ruling dynasty, a political power struggle or an enormous volcanic eruption of Mt. Merapi. It was rediscovered on 19th century by the British rulers. Similar to other religious monuments, it is also adorned with bas reliefs. Its narratives depict the story of the Hindu epic Ramayana. 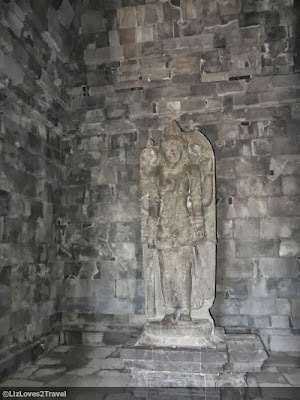 You can find these galleries in the three main temples. 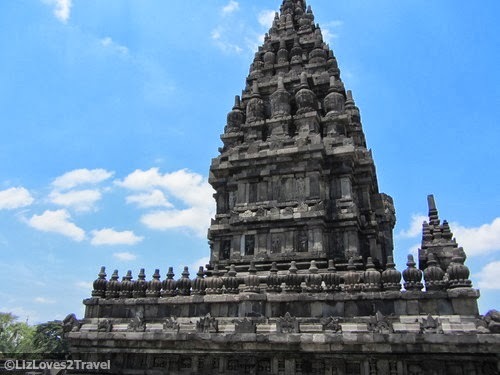 Aside from the reliefs, you may also find statues of the Hindu gods or deities inside the main temples. The 2006 earthquake had caused serious damages to the temples of Prambanan. Shiva Temple was primarily affected. To this day, it is fenced off and visitors are required to wear a hard hat before entering the premises. They also limit the number of people going in for safety precautions. 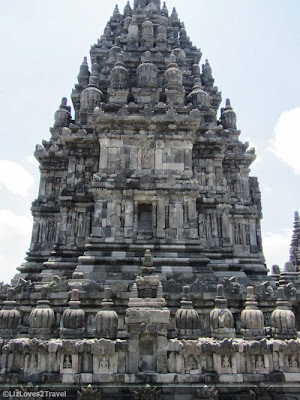 Honestly, I was a bit disappointed with Prambanan. I think it is overrated. The ticket is just $2 less than Borobudur and it's not even half of its worth. Aside from the fact that it is smaller area-wise, the complex also has more ruined temples than those in great condition. There's nothing much you can see. The restoration jobs done here were not as good as in Borobudur. That's in my opinion though. I'm not sure if others felt the same way. I'd also love to visit the nearby Candi Sewu but we only had a limited time. That's one thing I don't like when getting tours. We left the place after an hour. We were dropped back to our hotel at around 2:00 PM. I had a headache after this tour that I just decided to take a nap that afternoon. That night, I met a fellow travel blogger friend for dinner. 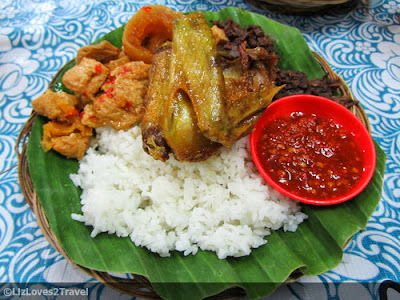 We were both in Jogja at that time and we haven't seen each other yet. We did some catching up and some walking around. 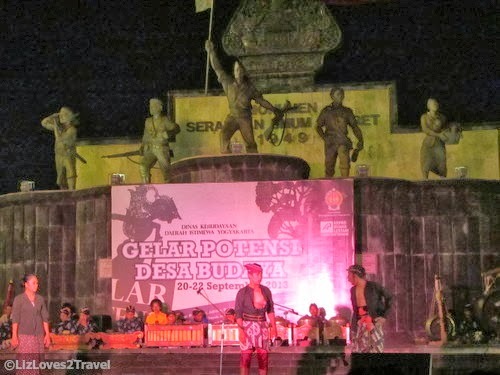 We were able to catch another traditional performance at the monument that night. Unfortunately, it was about to end when we arrived. This is Part 3-2 of my Yogyakarta travel series.